Muhlstein - Front Range Research Associates, Inc. In July 2013, while working on a National Register project in Saguache, Colorado, we met Rick Barandes, a transplanted New Yorker and local antiques dealer. After spending some time looking at his shop, he said he had something special to show us: an old photo album with a decorated brown paper cover and photos and captions written in old style German script. Apparently associated with a family named Mühlstein, the album focused on one young girl, showing scenes of southern Germany and Europe. The older photos stopped abruptly in the late 1920s; the album also contained three later views dating to the early 1960s. Rick explained that he had been given the album by a friend and business partner about thirty years ago while he was engaged in the out-of-print periodical business in New York City. His friend did not provide any background on the album, but he recalled the friend’s parents were Holocaust survivors. Rick speculated the family shown in the album were German Jews and that the abrupt cut off in 1928 might have been due to the rise of Nazism. He gave us the album saying he hoped we could find a proper home for it. After receiving the album we showed it to a few of our fellow historians, but none of us could get very far with the old-fashioned German script. Partial translations of selected pages by a German friend indicated the cover with the photo of the girl reading "Als ich ein kleines Mädchen war" translated as “When I Was a Little Girl” and "frei nach Kastner," meant “according to Kastner”. The "Verlag Mühlstein und Co. Genef" was (Mühlstein Publishers and Company, Geneva). 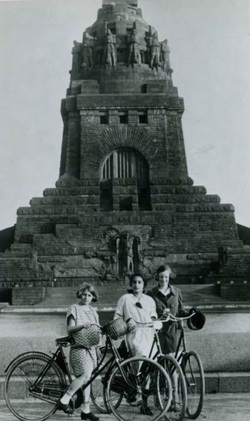 The friend Identified the monument in a 1923 photo as the Völkerschlachtdenkmal Monument in Leipzig, commemorating the victory over Napoleon's troops in 1813 (right). The latter suggested that the album might have ties to that area of Germany. We contacted the Beck Archives at the Rocky Mountain Jewish Historical Society in Denver about whether they would accept the album. However, the archivist there indicated they only take in things related to the history of the Rocky Mountain region. We also attempted some research on Mühlstein families in Leipzig, but turned up little information. A planned trip to visit Laurie’s brother, who was living temporarily in Berlin, presented new research avenues. He wanted to take us on a side trip to Dresden and Leipzig, and we wondered if we could find anything In Leipzig that would provide clues. We took the album with us, and Laurie’s brother arranged for us to have dinner with two of his German friends (Harry and Sabine Linke) who are teachers in Leipzig. They very kindly looked through the album with us and helped with its understanding. For example, we learned the album was modeled by its creator after the work of a German intellectual, poet, and writer of popular children’s books: Erich Kästner, who wrote a popular autobiography of his early years called When I Was a Little Boy, published in 1956 in Berlin. This explains the writing on the cover, “When I Was a Little Girl,” the “according to Kästner," and the allusion to a “publisher” on the rear cover. The album is supposed to look like a book illustrating the childlhood of the girl featured in the album’s photographs. Kästner (1899-1974) grew up in Dresden and was drafted into World War I, thereafter becoming a pacifist. He lived in Leipzig during 1919-27 and Berlin in 1927-45, where he opposed the Nazis. Kästner’s books were considered not to be in the proper German spirit and were burned by the Nazis. Their publication was banned in Germany, but his books were then published in Geneva. One source reported his works were very popular among Jews in the 1930s-1950s and were also translated into Hebrew and were popular in Israel. In 1960 Kästner’s book won an international Hans Christian Anderson medal. So, using his autobiography as a model is not out of sync with the notion that the Mühlsteins were Jewish. Since Kästner’s autobiography was not published until 1956, it appears the album was assembled no earlier than that year using photographs taken during the early decades of the twentieth century. Under magnification, the captions appear to be written in ballpoint pen which did not come on the scene until 1945. We put together a file of the captions supplemented with information supplied by our German friends. They thought the album contained two different sets of handwriting in the book. They could not decipher all of the old script. The Linkes felt Mühlstein could well be a Jewish surname. They also knew German Jews sometimes adopted Christian traditions as a way of assimilating with the broader culture. During our time in Germany we viewed a number of exhibits about the Holocaust and Jewish life during the twentieth century. In the Jewish Museum in Berlin and in the city history museum in Leipzig we saw information reporting many German Jews regarded Christmas as quasi national holiday more than a religious one and therefore celebrated it. Some Jews converted to Christianity in order to avoid persecution and others adopted some of its traditions to fit in better with the larger society. This information supports Rick Barandes’ belief that this album could well depict the life of a Jewish family. In examining the photos in the album, Tom found that one was a 1931 postcard addressed to a “Frau Th. Mühlstein, Leipzig, ___str. 10." The Linkes noted a popular first name in the early twentieth century was “Thea.” However, Tom found the following listing in the 1936 Reichspostdirektionsbezirk (a postal directory of residents for Germany arranged by city): Mühlstein, Thekla Frau N 22, Fritzschestr. 10, Leipzig. After we returned home, we looked at some of the websites with information about Jews in Germany during the period covered by the album, but did not locate any definite new information. A 1928 image contains the only clue as to the name of girl, who is labeled as "Gerda" in the caption below. Thus, the subject of the album may be Gerda Mühlstein. 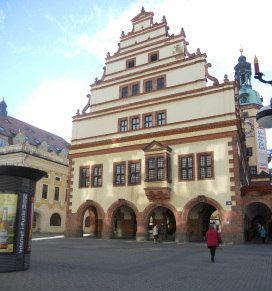 Before sending off the album, we conducted additional research on Jews in Leipzig and found two sources of interest: Monika Gibas, Cornelia Briel, Petra Knöller, and Steffen Held, “‘Aryanization’ in Leipzig. Driven Out. Robbed. Murdered,” Touring exhibition, 2009 and Robert Allen Willingham, Jews in Leipzig, Germany under Nazism, Communism, and Democracy: Politics and Identity in the 20th Century (Lewiston, New York: Edwin Mellen Press, 2011). We scanned each page of the photograph album and produced a PDF document of its contents. Selected photographs were individually scanned. The album was shipped to the Leo Baeck Institute on 6 April 2014, and we received an official acceptance letter on 6 May. The PDF of the album is available on the Institute’s website. As more people become aware of the album, it is hoped that more information on the Mühlsteins and the provenance of the album will come to light. The album features a homemade dust jacket of brown paper, with writing in German on the front and back and a black and white photograph affixed to the front. The cardboard cover measures 24 cm high, 20.5 cm wide and about 2.5 cm thick; the back and front are pale green and the spine is dark red. The album contains thirty bound pages with glassine spiderweb pattern interleaving sheets (right). The thick paper pages are 23.2 cm high and 18.5 cm wide; the interleaving is slightly smaller. Twenty-six of the album's thirty pages contain photographs, varying from one to three photographs per page and totaling forty-five photographs in all (counting the cover photograph); the rear four pages are blank. All but two of the photographs are black and white, and nearly all are dated in ballpoint pen below the image with many providing location information. The production date and country of the blank album are unknown, but it is believed to be of German origin. As Emily Mohney, Collections Manager, Illinois Holocaust Museum and Education Center, reported, their collection contains “lots of pre-WWII/WWII era photo albums from German families. A majority of these albums have sheets of interleaving with a spider web pattern” (Collections to Collections Online Community, 13 November 2013). The use of the Erik Kästner theme suggests the dust jacket and perhaps assembly of the album occurred after the 1956 publication in Germany of his Als ich ein kleiner Junge war (When I Was a Little Boy).